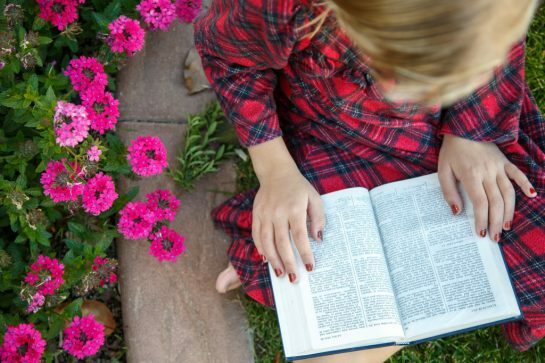 As women, we join our voices in the storied conversation surrounding the scriptures. Scriptural criticism and scholarship is a deep well from which we can draw increased wisdom. The work we do as individual readers can contribute to that well, which is sure to become an ocean of witnesses. Every textual reading leads to new revelation and avenues of exploration. The Church leadership are elevating the scripture reader and her individual devotion. The response of individual hearts and God-responsive minds to the text will bear out in incredible ways in the lives and religious practices of the men, women, and children in the Church. As we strive to become even more educated in our conversations about scriptures, I hope we each can become more vocal in sharing the insights we have. Church leaders are encouraging us to share our insights. Commenting, creating readings, teaching truths, has never been just about a few teachers. It has always been about us, and this new model, “Come Follow Me,” can allow us to get in touch even more deeply with what God’s word is for us and what we, as women, have to say about God’s word. In this spirit of the “Come Follow Me” curriculum, which is reader-centered and reader-directed, I will give you a little slice of my brain as I read the scriptures for this week’s lesson. These thoughts contain my own experiences, paraphrases, and insights, which allow me to follow threads of inquiry in books, prayer, journaling, and research as I feel led. All questions are welcome because they lead to new knowledge, and when tutored by the Spirit the revelation we receive as readers can be truly great. Daniel 2:1 God gave Nebuchadnezzar a symbolic dream of the kingdom of God. God cares about all His children, and the irony of one mighty king being shown the true Kingdom is not lost. A troubled spirit can lead us to look for answers. 2: The king used his best resources to find answers—in this case, it’s sorcery and astrology, which are shadows of the priesthood and of connective revelation with God. 3: Nebuchadnezzar really wants to know what his dream means. His soul is actively seeking more knowledge. 4: The people he calls in are sycophants. They don’t care for his best interests, they only care for their lives. They’re doing the best with what they have. 5-9: Nebuchadnezzar’s ego swells. He institutes a test to see if the sorcerers are able to tell them his dream, but they are not visionaries and cannot. They ask the king again to tell them his dream. In his anger (hanger?) he says, “Ye have prepared lying and corrupt words to speak before me.” He could see that they are false sorcerers, or he is just spiteful and angry that they cannot give him what he wants. If they fail the test, he will kill them. What was Nebuchadnezzar’s personality like? What were his strengths? We see some of his weaknesses. God clearly cares about redeeming him and giving him a proper understanding, saving him from himself. God also knew this revelation would be written down and that it would be significant to us today. 10-11: The Chaldeans know what they don’t know. The king’s expectations are too high, but they’re trying to do a good job. They see that dream interpretation is a matter for divinity. Were any of these advisers women? How did women’s wisdom and liminality function in a royal court? Were there any of these women who were inspired of God? Why weren’t their stories written down? 12-13: We can be seekers of truth and also be flawed, but Nebuchadnezzar escalates big time. He doesn’t just want to kill the wise men who couldn’t help him but all of the Babylonian wise men. Anger problem. Power corrupts but absolute power corrupts absolutely (Sir John Dalberg-Acton). These types of leaders pop up again and again throughout world history. God is mindful, but how do you stop a runaway train? With a revelation? 14-15: Daniel’s like, what’s up? Why is Nebuchadnezzar suddenly itching to kill people? Arioch the captain of the king’s guard amazingly tells Daniel why the king is so upset. He could have just killed Daniel. One of those thin lines between catastrophe and mercy. 16-18: I imagine Daniel, a man who has a relationship with God and who has God’s inspiration flowing to him because of his clean life, approaching this matter-of-factly. He’s confident in his relationship with God but is also trying to save people’s lives. He has been trained and he’s not panicking. Culture shock of living in the Babylonian court after coming from Jerusalem. Learn more about Daniel. Was he royal (“of the king’s seed” Daniel 1:3)? When was the Book of Daniel written? Learn more about its critical reception throughout the history of biblical scholarship. What do I need to be getting out of this book? I could go on and on, but I’ll stop here. We all have been taught what the dream meant, that all the kingdoms of the earth are infinitely transient and inferior compared to the Kingdom of God, which will one day fill the earth like “a stone…cut out without hands…that became a great mountain and filled the whole earth” 2:34-35). I have yet to discover the revelatory potential for that vision in my life. No doubt many of you have already had life-changing and important insights into this vision that should not be lost and should be shared with your family, friends, and with us. Unlike many of our sisters in centuries before, we are allowed to interpret scriptures. We are encouraged to interpret them. We have all been close readers and appliers of the word to our daily lives. How can we go deeper? What are the good, better, and best questions we need to be asking of the texts? What life-saving understanding do we need to gain now so we can save kingdoms of wise men and women later?